I’ve been a recycler since my childhood days. I always saved bits of fabric, string and paper to create collages or fold them into 3 dimensional objects to create a mini city. This is a habit that extended into my life as an artist today. In weaving there is a lot of waste. Long strands of unweavable yarn at the beginning and end of a loom woven project are inevitable. Although the strands are too short for the kinds of projects I do, I save the yarn and have used them to stuff pillows and add fringe to other projects or used them in Creative Aging MidSouth workshops with senior citizens. 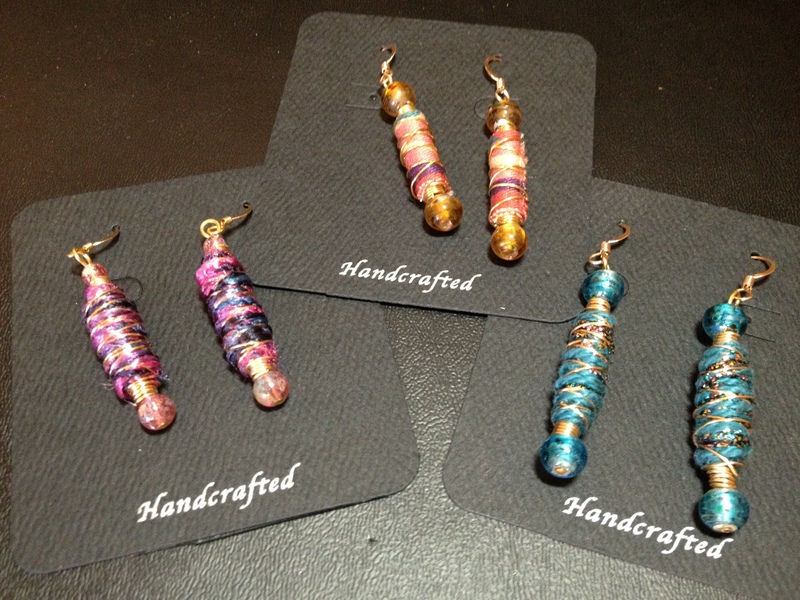 This spring I used my bits of leftover yarn and scraps of fabric from the linings of the purses and bags that I weave to create earrings. With the addition of some beads and wire they turned out quite colorful because the fabrics I choose always seem to be bright. The pair in the center is wrapped with fabric cut from upholstery scraps that I use for purse lining, and the other two are wrapped with strands of yarn. Paper packaging also seems excessive to me, and I find that every week I recycle several folded boxes from food products and toiletries. 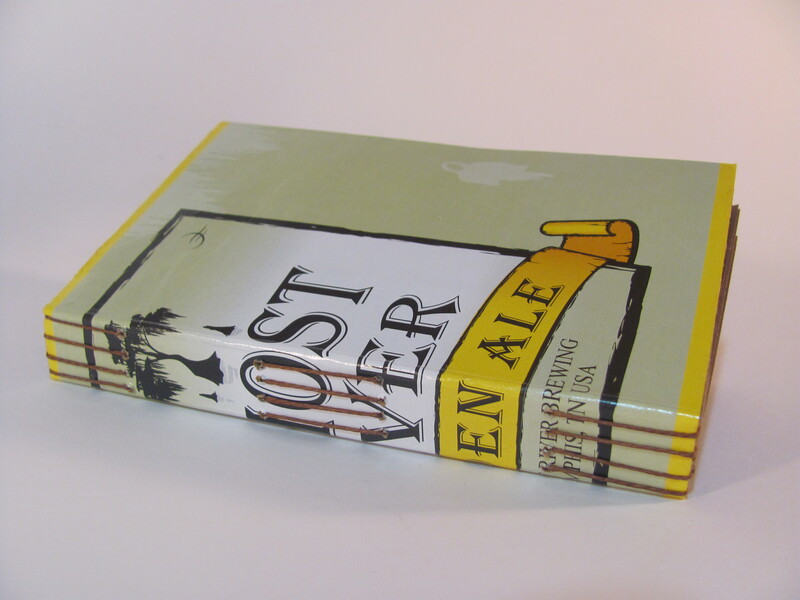 Occasionally we have a few beer cartons which I salvage and use them for covers of my handbound books. And I suspect that my collection will grow because lately Memphis has become a sort of hot spot for breweries. You can read about that here. This fellow Memphis blogger is a local foodie and biking enthusiast who also knows his beer. My latest handbound books made from beer cartons are currently for sale at Allie Cat Arts, a funky and eclectic art gallery in the Cooper Young neighborhood of midtown Memphis. Oh, and my earrings are sold there too! And for those interested in making their own mini version of these recycled books, I will be teaching a class at Allie Cat Arts in late August. 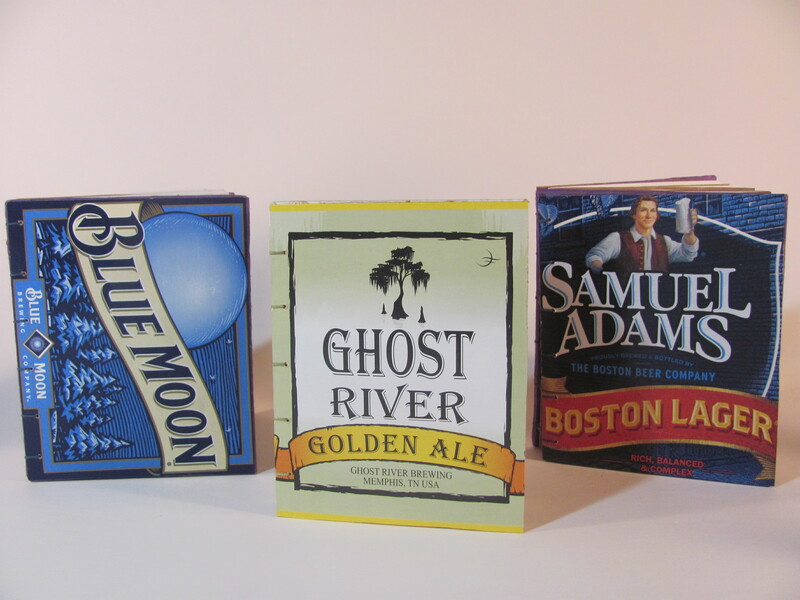 Participants need to bring only their own beer cartons and brown paper bags. 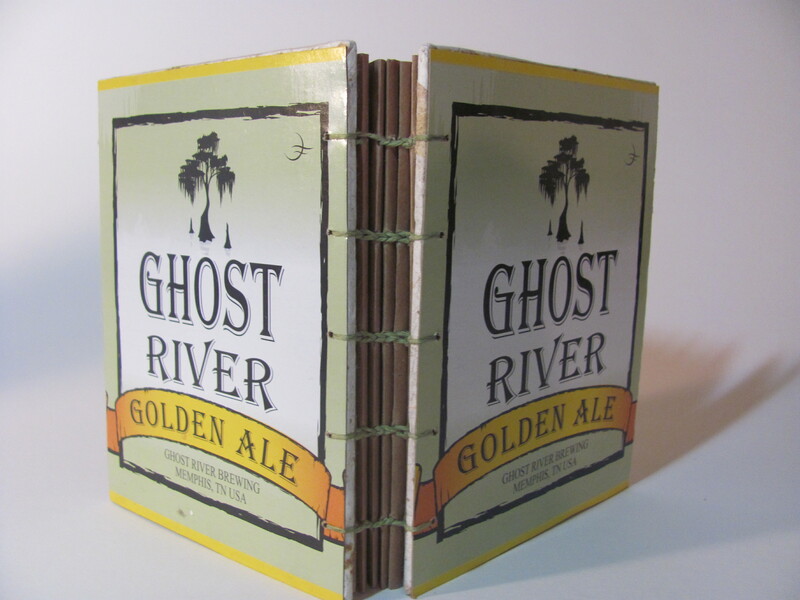 The mini Ghost River book above utilizes a long stitch binding that a new learner of book arts can easily sew. Below is a detail of the hand stitching that I have incorporated into the spine of the full size Ghost River book currently for sale at Allie Cat Arts. I know how I’ll be staying cool as the dog days of summer are upon us here in the South.